Sometime around 1899 saw the creation of a narrow dirt laneway called Erie Terrace. In 1923 it was renamed Craven Road. 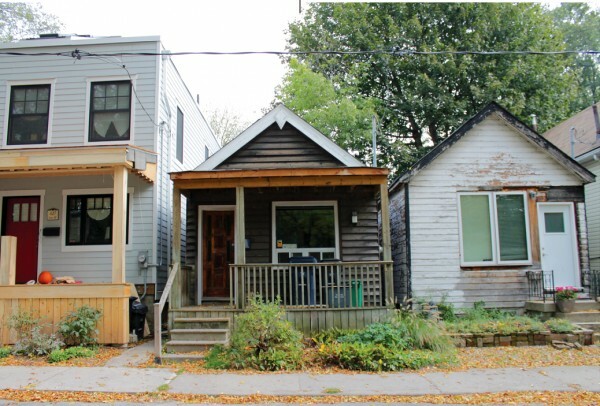 It is home to Toronto's smallest houses and longest wooden fence. Posting is sporadic, but comments are always welcome: oncravenroad [at] gmail [dot] com. 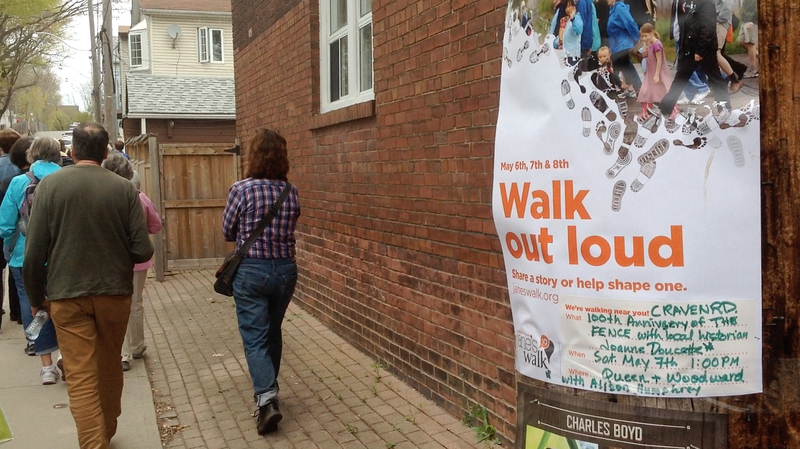 More Jane's Walk gems from Joanne Doucette! "Are you interested in a particular address on Craven Road? I have posted my sources for my walk in numerical order from 1 Craven Road on up. I will be updating this with more material later today and as I find it or as people send it to me by email at liatris52 AT sympatico DOT ca"
Jane Jacobs and the Craven Road fence both celebrate their centenary this year. 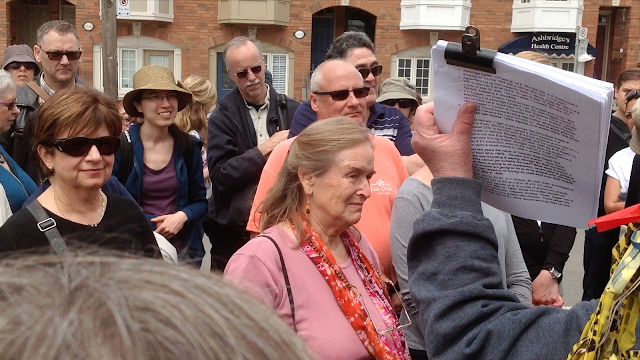 Yesterday's memorable Jane's Walk, "Erie Terrace to Craven Road: Tiny Houses, Tall Tales and a 100-Year Fence," drew nearly a hundred walkers and dozens of stories shared both by local historian Joanne Doucette and by longtime residents. 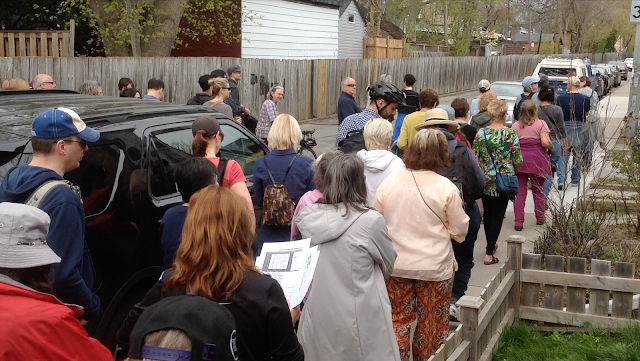 The capacity crowd spilled off the sidewalk and into the road (parted with the occasional street-hockey cry of "Car!") as the tour progressed northwards along Craven from Jonathan Ashbridge Park to the train tracks. One enterprising young resident had the foresight to set up a stand to sell cupcakes and fresh-squeezed orange juice partway along the route. Hungry walkers bought up the entire stock. An insightful, entertaining and generous raconteur, Joanne carried a sheaf of notes featuring stories on "about every second house," and whenever an occupant was present, she would hand that page to them once the story had been shared. Many thanks to all who came out to share the road! 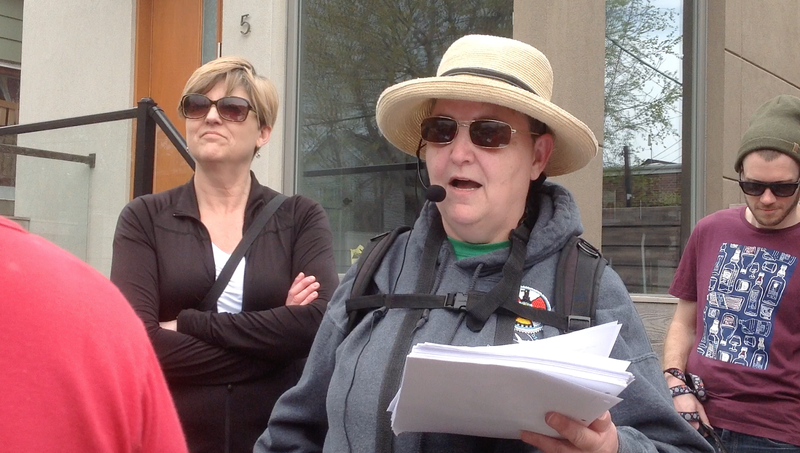 Local historian Joanne Doucette has just announced she will be leading a Jane's Walk next month, in celebration of the Craven Road fence's 100th anniversary! 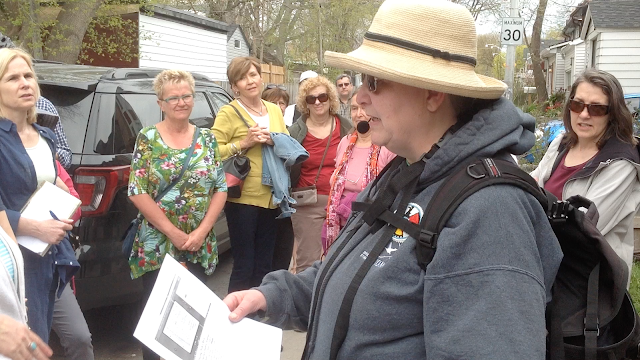 Titled "Erie Terrace to Craven Road: Tiny Houses, Tall Tales and a 100-Year Fence," the walk will begin near the foot of the road, and will travel northward through the ages to finish at Danforth Avenue. Duggan intentionally developed Erie Terrace as a “shacktown” with tiny houses on tiny lots and no infrastructure. At the same time, he held back the farm to the west, intending it to be developed later for more lucrative lots with more substantial houses. That is why the west side of Erie Terrace (Craven Road) was not built on. 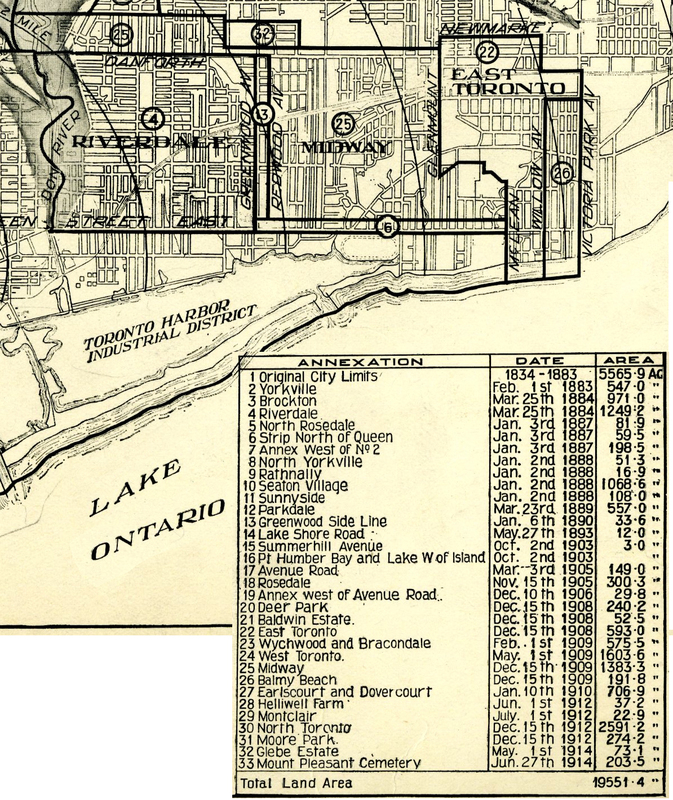 To see all the maps, plus the Toronto Star's Jan. 24, 1924 announcement of Erie Terrace's name change to Craven Road, read Joanne's full post here! You have a fence on one side, a mess of old and new homes on the other, and just that vibe, that weird vibe that is Toronto at its most odd and wonderful. No one planned this place; it built its character over time. Craven Road might be the most interesting street in Toronto. 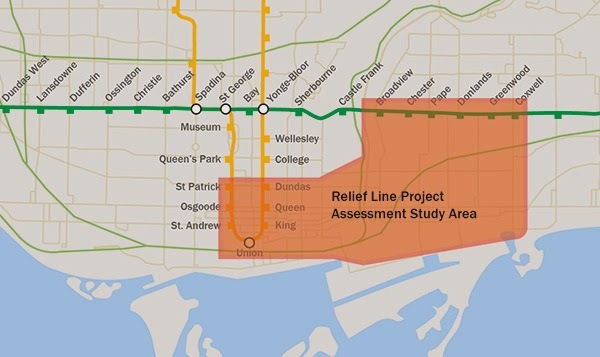 The TTC's Downtown Relief Line is in the news again, with a new poll calling it Toronto voters' highest priority, topping even the Scarborough subway and the Smart Track proposal that was John Tory's mayoral platform keystone last fall. We've been here before – one hundred years ago. After the widening of Erie Terrace (now Craven Road) in 1916, the street saw one more burst of newspaper coverage. Five articles between 1919 and 1921 mention a plan for a "Hydro radial," a railway radiating out along Ontario Hydro-owned rights-of-way from the city centre to the suburbs, one branch of which could have run right along Erie Terrace. 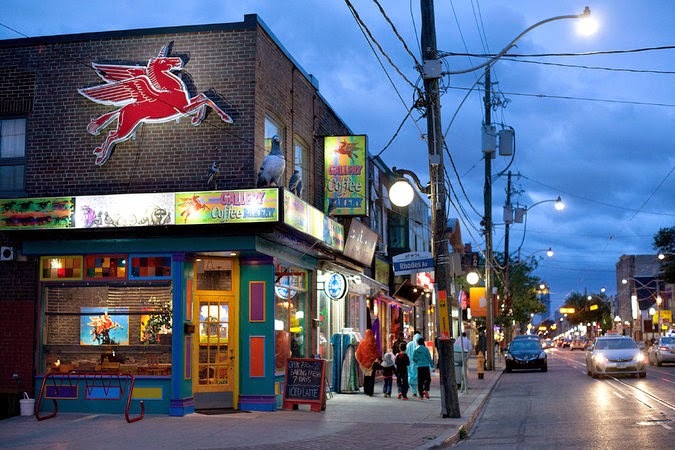 Michael Kaminer conveys the changing face of the Gerrard East strip for the the New York Times in "For Toronto’s Little India, a New Crowd". The Toronto Star has been running a cool series to find "hidden experts" as part of their year-long Big Ideas project on how to make Toronto better. When Nicole Stewart imagines the future of Toronto, she likes to think small — really small. “What I’m suggesting isn’t any sort of shanty town or RV home in the city. I’m talking about really well-made, well-designed homes,” she said. The phenomenon has exploded across the U.S., Europe and in some Canadian cities like Vancouver. But Toronto’s building code still contains some provisions that prevent landowners from building tiny homes. 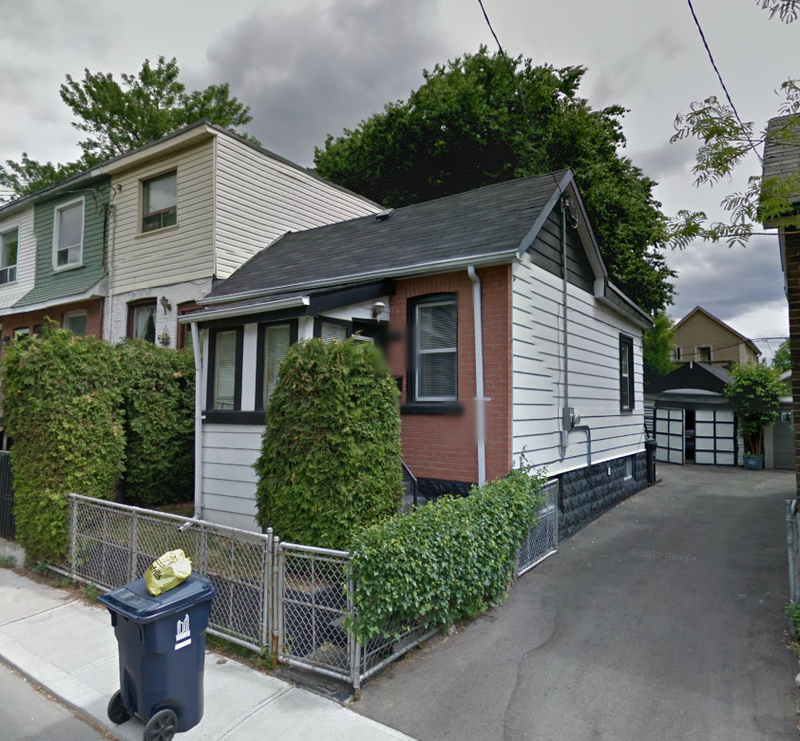 The city does have a “Tiny Town,” on Craven Rd., near Gerrard St. E. and Coxwell Ave., the largest concentration of detached houses under 500 square feet in Toronto. The homes were built for manual labourers at the turn of the 20th century. Interesting how one tiny word – "for" – can warp the story of an entire street. Because as important as social housing is, the idea that the houses on Craven Road were built "for" rather than "by" the people who lived in them is simply ahistorical. These houses were built according to the individual vision of whoever acquired each small lot. And even those lots are irregular sizes, since the land was sold by the foot, like cloth off a bolt. "Is Craven Road the weirdest street in Toronto?" asks a new post on blogTO. Why, thanks for asking. Yes. Yes it is. before Craven Road, the Ashdale homes had huge backyards that were more than 42 metres long, prompting owners to subdivide their lots. After a dispute over who owned the property surrounding the homes, the city bought the land in question, put up the fence, and laid down the road. Neither Craven Road (formerly Erie Terrace) nor Ashdale Avenue appear on a map of the area from 1892. 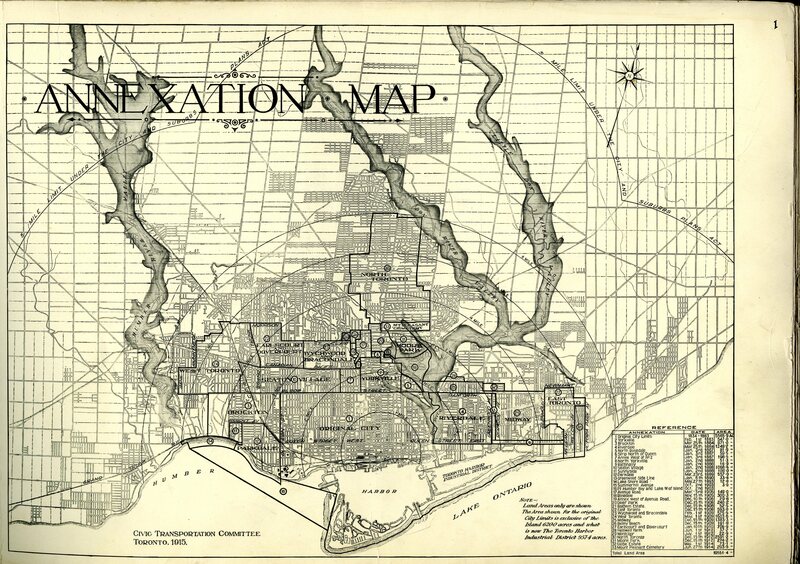 Then they both make their debut, side by side, in the 1910 Goad's Atlas of Toronto, the year after the City of Toronto annexed their neighbourhood (formerly called Midway). See this post for both maps. This street was developed as a 'shacktown', outside of Toronto, in the 1890s... Ashdale Avenue was not subdivided until later. No houses were built until later when its large lots were sold to more affluent buyers. This is why Craven Road only has houses on the east side. Ashdale Avenue's bigger homes were built with their backs turned on disreputable Erie Terrace. The rowdy poor of Erie Terrace were often accused of trespassing. 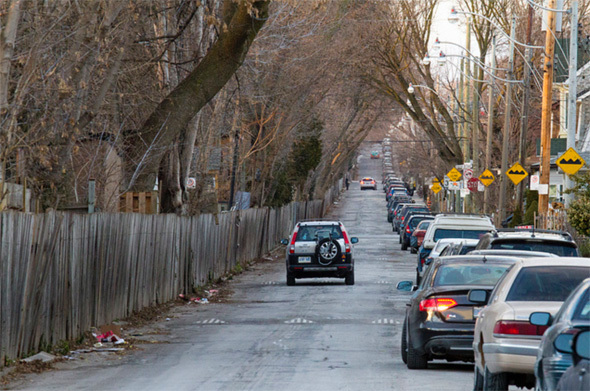 When the City of Toronto widened Erie Terrace, Ashdale's home owners had nothing to gain. They lost some of their property and taxes went up to pay for the wider street. A deal was made. The City of Toronto put up a tall wooden fence to keep the poor out of Ashdale yards. Better, but still not quite the full story. The truth is that in 1916, after much political wrangling with the residents of both streets, the City of Toronto did indeed widen Erie Terrace, from as little as 18 feet in places, to the city's legal minimum of 33 feet. Far from being out of pocket, Ashdale's homeowners did not pay for the widening of a street they did not front on, and they received fair market value for the sale of between nine and fourteen lot-depth feet of their (to this day, quite considerably deep) backyards. The city paid less than half of the $44,500 to buy the backyard land and grade the street. The lion's share, $25,000, was charged to the owners of property on Erie Terrace, at a rate of $4.85 per foot of frontage. 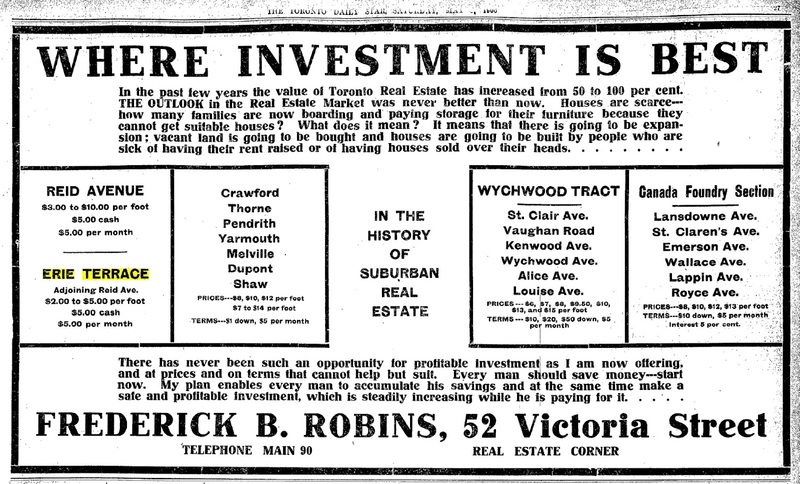 As the Toronto Star remarked at the time, this was "a heavy tax on land worth only $20 per foot." 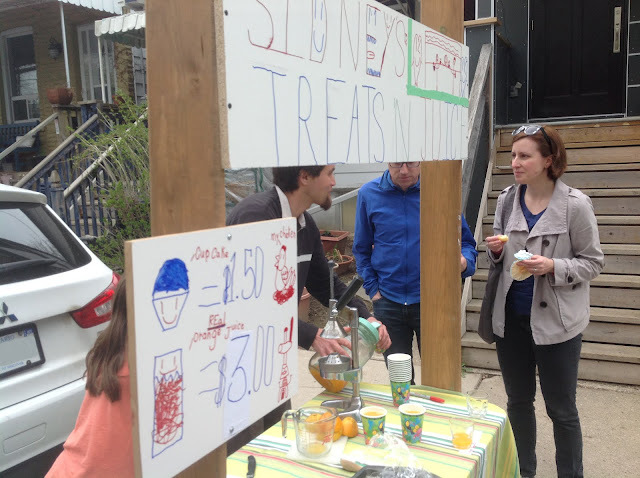 The idea of a mini, wooden Berlin Wall to keep the "rowdy poor" of Erie Terrace out of the backyards of their more affluent Ashdale neighbours is a colourful story. I happily told it for years. Residents on Ashdale avenue are asking for a right-of-way on to Erie terrace, but the residents of Erie terrace have strong objections to their neighbors deriving benefit from the widening of their street, an improvement they have to pay for. In the widening of Erie terrace there was a foot reserved strip left between the rear of the Ashdale avenue lots and the new roadway on Erie terrace. This strip was reserved to prevent the property owners on Ashdale avenue building on the street line on Erie terrace. Mr. H.M. East owned a lot fronting on Ashdale avenue about 134 feet deep. The city expropriated the rear 14 feet or thereabouts. Subsequently Mr. East sold the front 90 feet, leaving himself with some inaccessible rear land, because in widening Erie terrace the city is erecting a high fence to prevent the residents of Ashdale avenue obtaining access thereto. Consequently Mr. East can only obtain access to his property from Ashdale avenue over the land sold by him. 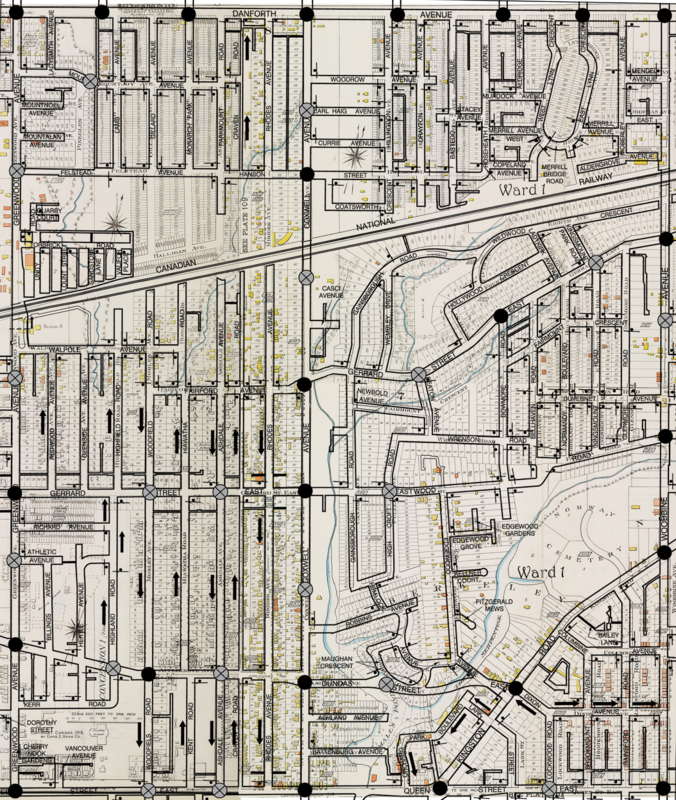 For all the gory details on the origins of Craven Road see last year's posts Origin Stories and On the Fence, as well as the Toronto Archives' 1916 documentation in Craven Road in Archive Photos. Craven Rd (Director's Cut) from Made By Other People. In Pigs, flowers and bricks : A History of Leslieville to 1920, Joanne Doucette recounts that "Working class families often built their own homes. Sometimes they lived in a tent or in the basement of their house while working on building the rest of the house over their heads." So you can imagine the allure of a mail-order home that came flat-packed like an Ikea bookcase, and promised that you didn't even need a saw to assemble it. A "knocked-down" house kit included everything from the pre-cut foundation timbers to the shingles, along with instructions for the owner-builder to put it together themselves. 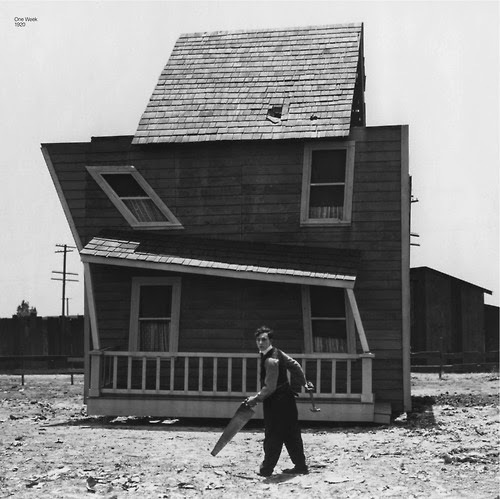 First introduced around the turn of the last century, this revolutionary new housing solution became so popular that Buster Keaton featured it in his first solo film, the 1920 silent short One Week. Aladdin Readi-Cut Homes – named for the fable in which a genie builds his master a palace overnight – used the tag line "Built in a Day". They claimed that "Skilled labor is absolutely unnecessary in any part of the erection and completing of an Aladdin house – because we supply the skilled labor in our mill, preparing the entire house for you to fit together in a few days." As the 2013 ice storm reminds Torontonians how lucky we (usually) are to enjoy mod cons like electricity, here comes another way for the more fortunate to experience life without them. 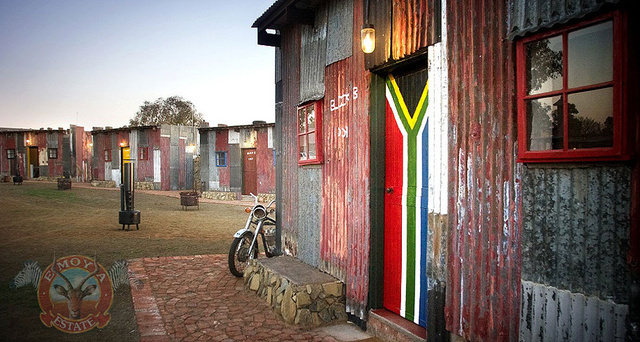 The five-star Emoya Luxury Hotel and Spa points out that "Millions of people are living in informal settlements across South Africa... Now you can experience staying in a Shanty..."
Well, maybe not exactly. Located "within the safe environment of a private game reserve," this is "the only Shanty Town in the world equipped with under-floor heating and wireless internet access." We may jeer, but maybe, in some twisted way, this is part of the mental gymnastics the average Westerner needs to do to understand our relative wealth in its global context. Speaking of cartography (we were – it was just a while ago), the rather awesome website maps.stamen.com lets you make your own beautiful aerial imagery using OpenStreetMap data. Here's an interactive view of the Craven Road area – click to zoom and drag to navigate! 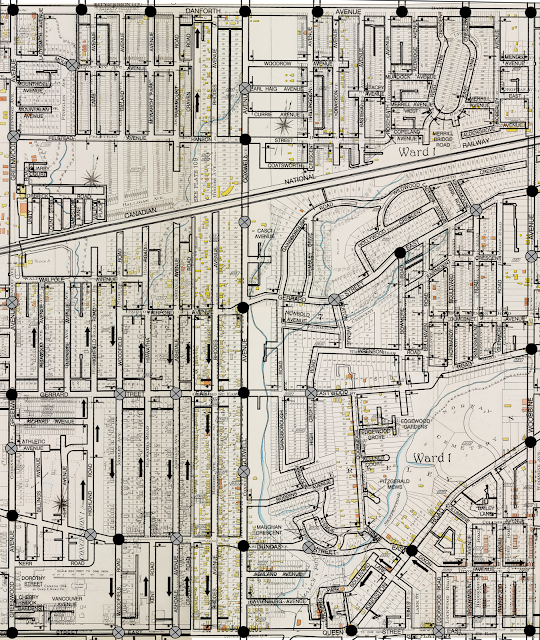 The earliest maps of the Craven Road area offer a fascinating journey. They don't always necessarily agree with each other, but each one gives some quirky little spark of discovery that can fire your imagination. Let's start in one of the earliest years the neighbourhood appears on a map, at least in any recognizable detail. 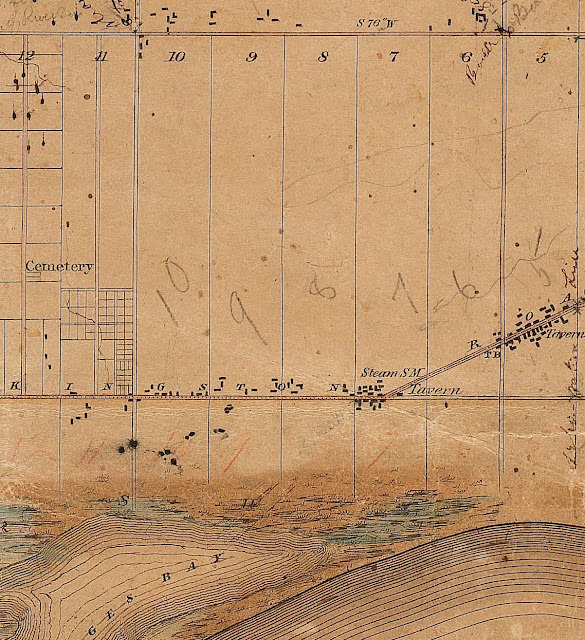 This image, courtesy of the City of Toronto Archives via Nathan Ng's fabulous website Historical Maps of Toronto, is from an 1851 map of the Township of York. 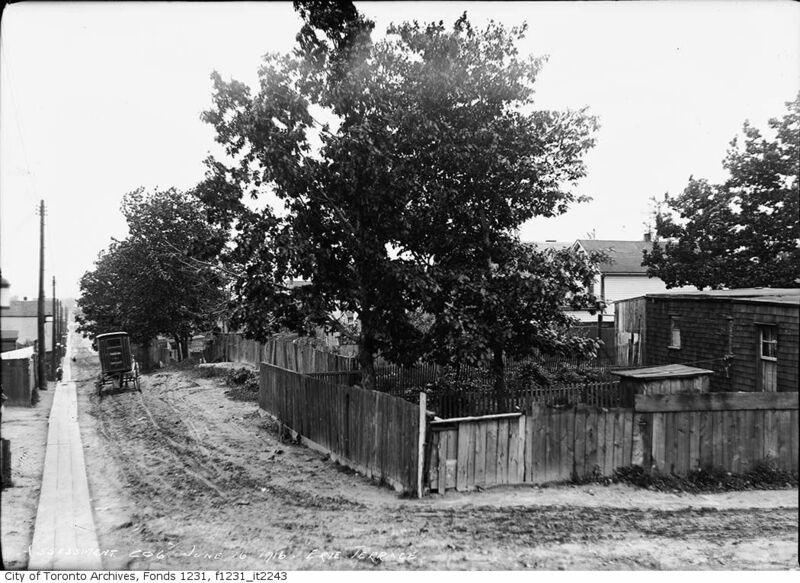 The five earliest photos of Craven Road in the City of Toronto Archives were taken on June 16, 1916, after the city decided to buy up a slice of Ashdale Avenue's backyards in order to widen the narrow, one-sided laneway then called Erie Terrace. Ironically, these images show Erie Terrace's dirt road and wood-plank sidewalk, but reveal very little of its houses. The photos look south and a little west, focusing on the Ashdale side of the street, since they were taken to record the backyard property being expropriated to widen the street. The Media Discover "Tiny Town"
"In the east end of Toronto, between Coxwell and Greenwood Avenues, there’s a place called 'Tiny Town.' The neighbourhood name might not show up on a map, but if you travel up and down Craven Road you’ll realize that the area is truly the epitome of modest living. On Craven, you’ll find the largest collection of single houses under 500 square feet in the city. You’ll also find the longest wooden (and municipally maintained) fence in the city." 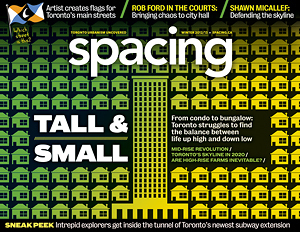 Spacing's February 13, 2013 article "Tiny House Society of Craven Rd. ", quoted above, is just one of several features on the street in the past few years. Craven Road (formerly Erie Terrace) has been in the news a few times over the years. A century and a bit later, on 22 February 2013, the same paper profiled a "House of the Week" at the bottom of the street, a brand-new, three-bedroom magazine-bait beauty selling for $889,000. Craven Road was once known as Erie Terrace, but before that, these lots that now house tiny buildings were attached to the back of properties on Ashdale Avenue — properties that used to extend back from the road over 140 feet. [Jack Ridout, a real estate agent whose family grew up on the road] says those who lived in the houses gave people materials to build places at the back of their lots. 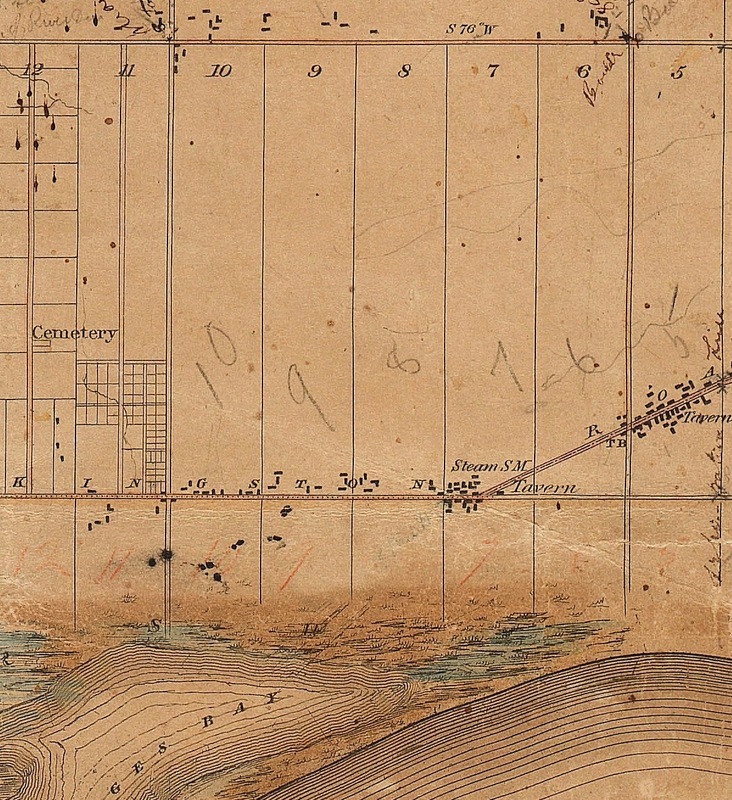 When there was a dispute over whose land belonged to whom around 1910, the City stepped in, expropriated the land, and created a tiny road between the houses on Ashdale and the rear lots. "$10 A FOOT – Erie Terrace, 100 feet north of Gerrard street cars, no money down, lumber supplied to build. Davis, 75 Adelaide east." And the idea that the narrow laneway was carved out of the backyards of Ashdale Avenue may be derived from the fact that when the City widened Erie Terrace in 1916, they did so by buying a chunk of the Ashdale residents' backyards.